In the previous part of this tutorial series, you saw how to implement the sign-up and sign-in functionality. In this part of the tutorial, you'll implement the user home page and the functionality to add and display the blog posts. Once the user tries to sign in to the application, you need to validate the user credentials and, if valid, create a session. To use sessions in a Node.js app, you need to install express-session using Node Package Manager (npm). Require the express-session in the app.js file. To use the session, you need to set a session secret. Now define a variable called sessions in the global scope. Assign the sessions variable in the /signin method using the request parameter. Using the sessions variable, you keep the signed-in username in session. Create an express route called /home which will render the home page for a valid user. As seen in the above code, when the user is redirected to the /home route, if sessions and sessions.username exist, the home page is rendered. Modify the signin method to send a success response on successful user validation. The above success response is parsed on the React side and, if successful, the user is redirected to the /home express route. In the main.jsx file, inside the Signin component inside the signIn method, modify the code to redirect to the home page. Save the above changes and restart the Node server. Sign in using a valid username and password, and you will be redirected to the home page. As seen in the above HTML code, the container div has been named app, inside which the React components will be displayed. Save the above changes and restart the node server. 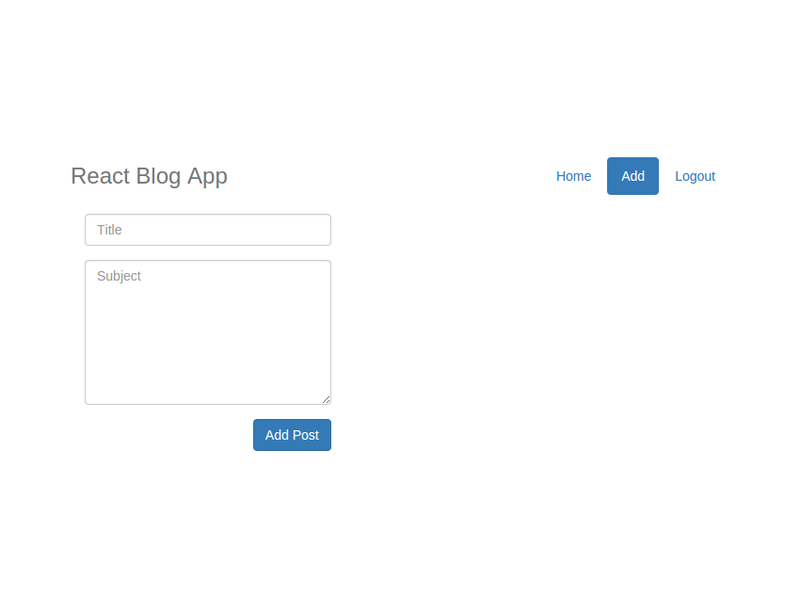 Sign in to the blog application and, once on the home page, you will have the ShowPost React component rendered. Now you need to dynamically populate the values in the post list. Before doing that, let's create a page to add a post. On clicking the above Add hyperlink, you need to display the page to add the blog post. When the user enters the title and the post subject, you need to handle the text change events in the React component. Add the following change event handler to the AddPost React component. Add the on change event to the AddPost render HTML. Bind the state variables and the events in the React constructor method. As seen in the above code, you have used axios to post the blog post details to the Node.js server. As seen in the above code, you connected to the MongoDB database using the connector and inserted a record. Once the operation is executed, you checked the error, if any, and returned the status to the callback function. Save the above changes and restart the Node.js server. Log in to the application, click on the Add link, and enter the details to add a post. Once done, click on the Add Post button and the details should be saved in the MongoDB database. The above code makes a post request to the Node.js server method /getPost which will call the getPost method in the post.js file. Here is the /getPost method in the app.js file. Once the post details have been fetched in the axios success callback, keep the details inside a state array variable. Declare a variable called posts inside the ShowPost constructor. The above code iterates the posts state variable and creates the HTML dynamically. Save the above changes and restart the Node.js server. Sign in to the blog application and create a few blog posts using the Add button on the home page. Once the posts have been added, they will get displayed on the home page. 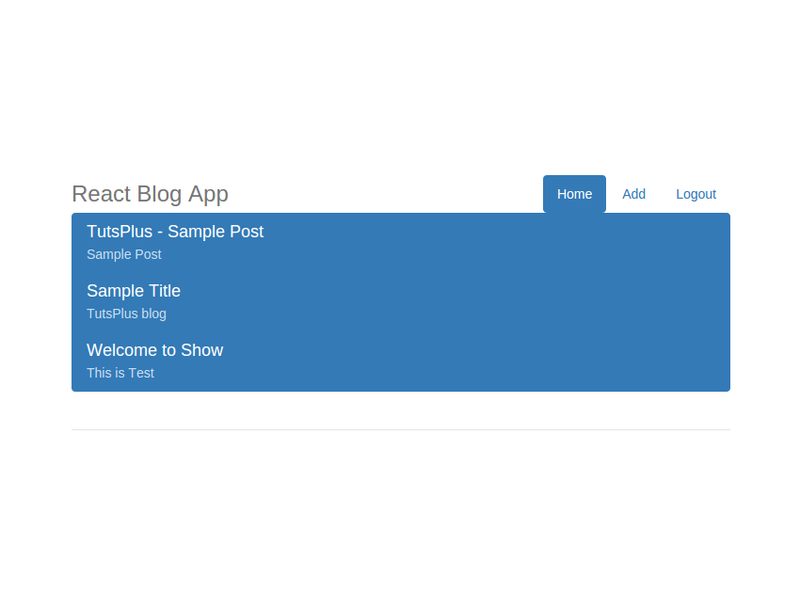 In this tutorial, you saw how to create React components for adding and displaying blog posts. In the next part of this tutorial series, you'll learn how to add the functionality to delete and update the blog posts. Let me know your thoughts about this tutorial in the comment section below. Source code from this tutorial is available on GitHub.